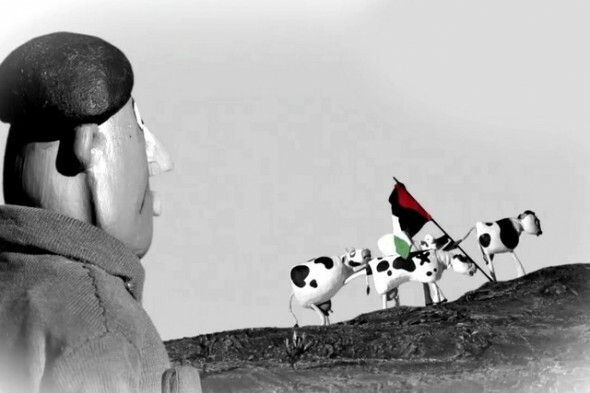 Five minutes into a film a friend described to me as “a documentary about the First Intifada,” I stared incredulously at the stop-motion animation of four cartoonish cows. The narrator introduced them as proud Ruth, pacifistic Rivka, overly dramatic Lola, and Goldie, the political activist. The graphics looked amazing, but I did not quite understand what animated cattle had in common with the power relations between Israel and Palestine. I soon found out the cows were a means of reducing Palestinian economic dependence on Israel — but they were also a lens for the representation of an important chapter in the Palestinian history. The Wanted 18, an inherently political film avoided politicization by narrating its story from the perspective of apolitical actors: cows. A few days later, I found myself listening to a talk titled “Point of View: Objective Truth or Personal Perspectives in Documentary Filmmaking,” which brought together the director of The Wanted 18, Amer Shomali, and two other filmmakers, who were also members of the documentary film jury, Christina Voros and Amar Kanwar. The event was organized by the eighth Abu Dhabi Film Festival, which offered many feature and short films screenings, as well as special events ranging from various workshops to Q&As and discussions on contemporary issues in filmmaking, with a focus on the Arab world. 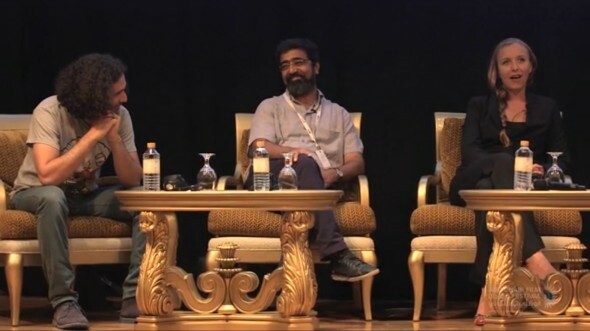 ADFF Point-of-View Panel: from left to right: Amer Shomali (director of The Wanted 18), Amar Kanwar, Christina Voros. The discussion about the place of documentary film in today’s world started with a discussion about truth. Voros pointed out that in contrast with reality television, the fundament of the documentary film is the element of truth. Kanwar probed the concept of truth and its usefulness: truth is fluid through time as well as through perspective. Therefore, he observed, we have to say “no” to static vocabulary and adopt an equally fluid, ever-changing form of documentary filmmaking to keep up; new genres keep appearing that escape the narrow label “documentary film.” The Wanted 18 plays with audience expectations and combines animated drawings with archival footage, interviews, and reenactments to produce a nuanced testimony of a historical moment. Regardless of our consensus about truth — whether one thinks it is absolute or relative, subjective or objective — we cannot overlook that once we attempt to capture it on screen, we frame it. A square two-dimensional motion picture is but a limited re-presentation of reality, and even without a narrative persona guiding the viewer experience, a restricted selection of scenes from real life is but a filmmaker’s perspective. I could not help but notice parallels in discussions about literature and film: documentary film can to some extent be compared to late-nineteenth- and early-twentieth-century European literary realism and naturalism. The trope commonly used to describe the literary movement at that time was to record everyday reality in order to depict it as objectively as possible, as if observing it through a camera. The perception that a camera can objectively represent the whole of reality with all its contingencies, however, is a fallacy. A camera is equally liable as the literature that invokes it to fail at recreating reality because even recordings of reality are necessarily filtered and subjected to an editing process that may include multiple points of view. The same applies to any work of literature trading on cachet of truth: neither is pure and unadulterated truth. Instead of talking about “truth,” I think it might prove much more useful to think about point of view. Point of view is one of the most important issues in writing but often remains unquestioned in film, especially in documentaries, which general audiences nowadays still perceive to be “objective.” In fact, point of view is the main and continuously dynamic tool of structuring the narrative: now a Palestinian activist is telling his story, now an Israeli commander, now the cows are mooing and wondering where they are and why. A self-reflective filmmaker will acknowledge his or her presence while addressing the limitations imposed on the art. He or she needs to navigate the waters of personal investment, avoid drifting into autobiography as well as propaganda, and open up space for the audience to come in with their interpretation. Similar to creative nonfiction in literature, documentary film uses reality and remakes it into an independent artwork. Voros explained that in documentaries, she values intimacy over sophistication, and emotion over beauty: a director employs what is true in order to give the audience access to a place they could not otherwise go. Neither literature nor the film industry however, have managed to escape the impact of the profit-driven economy that remade social relations in the twenty-first century. A member of the audience, an independent documentary filmmaker himself, asked the panel how to reconcile all the demands of the market: cinematic qualities, length, format, festival requirements… and ultimately, to abide or not to abide by audience expectation. Kanwar warned against making films according to a misleading idea of what is supposed to be “appealing” — to the general public, the target audience, the critics, a non-monolithic “million-headed monster,” as Voros dubbed it. She agreed with Kanwar, saying she only keeps market demands in the back of her head and instead pitches her films differently for different audiences. As a literature student, I look everywhere for crossroads between social phenomena and literature, and the two-way relation of one imprinting itself on the other. Even the arts are forced to conform nowadays to the consumerist mold in order to subsist; we hear they need to be more entertaining because entertainment sells. We live in the tyranny of entertainment. Something as seemingly neutral as the news media has been remade into “infotainment”: truthful news crucial to informing and raising awareness of global dynamics, but remade into hip, flashy, popular commodities, attractive to the consumer. The birth of a “docutainment” genre comes as no surprise when the market wants to sell us an entertaining truth: documentaries in which enjoyable and appealing elements supplant the connective tissue of unbiased representation of truth. The Wanted 18 walks a thin line and begs the question of when the stylish and funny animations start to hinder the “truth” the documentary is trying to present. Literature has long been experiencing an impulse to commodify as well: paperbacks of trivial literature and formula fiction occupy the lists of best-selling books and fill the bookshelves of airport shops in special promotions to “buy one and get one free.” Arts are perhaps losing their autonomy when they are preoccupied with an idea of audience perception and have to look for ways around it, as the panel expounded. (Creative) writing and filmmaking have become accessible to the masses: anyone with a smartphone can make a mini-documentary and post it online; anyone can write stories and many more get published than in the past. Constantly, professors tell their students to “show, not tell” a story. In his book on writing, subtitled A Master Editor of Some of the Most Successful Writers of Our Century Shares His Craft Techniques and Strategies, Sol Stein explains this direction: “The reading experience for a twentieth-century reader is increasingly visual. The story is happening in front of his eyes.” As an editor, he knows the books that sell most are the ones that show, unfold the story before the reader. I enjoy literature that consumes me, not just my sight, but my hearing, smell, taste, my body temperature, my balance, the sensory cells on my skin. Despite the contemporary impetus to push the narrator in the backstage in the name of objectivity, we should pay attention to and reevaluate the narrator’s place in literature, the same way we should always keep in mind the director of the documentary film and his or her point of view. The Wanted 18, for example, counts on the viewer to extrapolate and evaluate the narrator and point of view from parallel accounts: interviews, reenactments, and archival footage. The question “Objective Truth or Personal Perspectives” in the title of the discussion at Abu Dhabi Film Festival is therefore a false dilemma: whatever the truth is, it is fluid and can never be captured as a whole in an artistic work, but that still does not make it a subjective personal opinion. It is a dialectical synthesis of both, a representation of truth that is neither universal nor a mere private insight: it is an author’s prism through which audience should constantly reassess the truth and its place in the world.